A relaxed trip was how it was advertised. 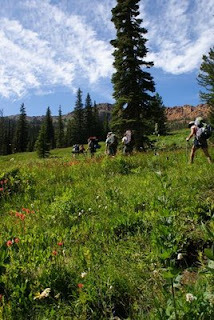 A 2-day backpack into Bean Creek Basin in the Teanaways at a leisurely pace; I was concerned I would have too much experience to fit in. At first, that was true, as the people I talked to were on their first or second overnight trip. We waited well past the meet up time of 8:30 at the Park & Ride in Seattle, then did the same in Issaquah. If this had been a piece of music, the tempo would be Largo, molti Largo, as in- as slow as you can get. It was just a little frustrating as my Type A personality (and other's, too) tried to relax and just let things happen but the conductor in me was falling asleep at the podium, baton falling from my hand. We finally got on the trail some time after noon. The way was very hot and dusty and steep in spots. But we took breaks, lots of breaks, although we moved at a decent pace, picking up to andante. Once in camp, at a lovely setting next to Bean Creek, we all set up camp, filtered water, photographed flowers and prepared for dinner. When Jack, the leader, announced his plans for a sunset scramble up to the ridge, the tempo started to pick up more syeadily, which is not to say that we were rushing, but at least we were setting goals within time constraints, moving into the moderato tempo. On the trail, it felt like the tempo was Allegro; or maybe that was just my heart pounding in my chest. I hadn't scrambled in a long time and had only been on one other backpack trip this year, not giving my legs enough time to transition from cycling. Jack was a good leader, as he stopped at regular intervals so we could regroup and rest shortly (presto), before setting off again. Up a steep section with loose rock we went and soon (gasp!) topped out on the ridge, with the sun and wind beaming down on us while a knock-dead view of Mt Stuart and the Stuart Range lay ahead. In the morning, it was time for another adventure after breakfast and we took off toward the ridge near Earl Peak. From that ridge, we were able to see more of the Stuart Range and those who wanted to go higher did. 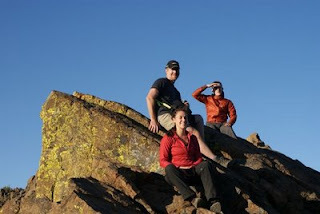 For me, the day's attitude was moderato and so I lingered on the ridge, soaking in the views. After the knee-shaking descent (I often sing to myself while descending), we were back in the flowers and packing up to break camp. On the drive out, we stopped at Jack's fave post-Mountaineer trip restaurant in Cle Elum, Los Cabos, tucked away behind the Safeway on the edge of town where I didn't pay any attention to the conductor or my baton; I just enjoyed the coolness of the a/c and the good food and companions. 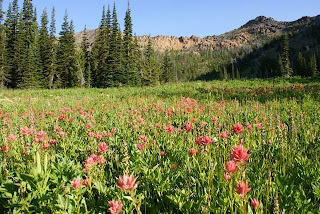 The star flower of the weekend was Scarlet Paintbrush. For photos of that flower, many others and our fabulous views, go here.